There is an endless list of design options that can enhance the decorative concrete steps and stairways to achieve a grand design at the entrance. You can achieve this by choosing our company, the best Concrete Steps Contractor in Lakeside. The most prominent features at the entrance are usually the concrete steps or terraced stairways as seen in homes and public buildings. But many times their functions are regarded as utilitarian. Improving the concrete stairs to make them look better will become the focus of attraction at the entrance. 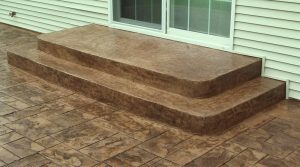 And a better visual impact is attainable by combining the decorative concrete stairways with the stained or stamped concrete walkways and the landings which add to the colors and patterns. If you wish, you can have concrete steps poured with your walkways or entryways. They will be perfect; their appearance can be enhanced by coloring them to match other features around. Precast concrete steps and stairs can also be considered as an option. With the right measurements, the steps can be built offsite and then installed on your property.